This weekend I will participating in the Zines and Indie Comics Symposium at The Edge, Queensland State Library, Southbank, Brisbane. You’ll be able to find me on Table 62, where I will have my Concept Art Book, Sketchbook, Prints and of course Hilt available purchase. As well as all the great comic artists and zine makers selling their wares, there’s also workshops and talks, which are well worth attending, whether you are looking for insight or inspiration. It’s a free event running between the hours of 12noon – 6pm Saturday, and 12noon – 4pm Sunday., so hope to see you down there. The good folks at RAW Natural Born Artists have invited me to showcase my artwork at their next show, Sensory. The event takes place at The MET in the Valley, Brisbane, on Thursday 28th May, and will feature a couple dozen other local creatives from fields as wide-ranging as fashion, photography and performing art. If you’re interested, click on the link below to purchase tickets, and be sure to select Nick Smith as the artist you are there to see. I can’t wait to see your smiling faces! Another weekend, another Supanova Pop Culture Expo. This time it’s down in Melbourne, at the Showgrounds in Ascot Vale. 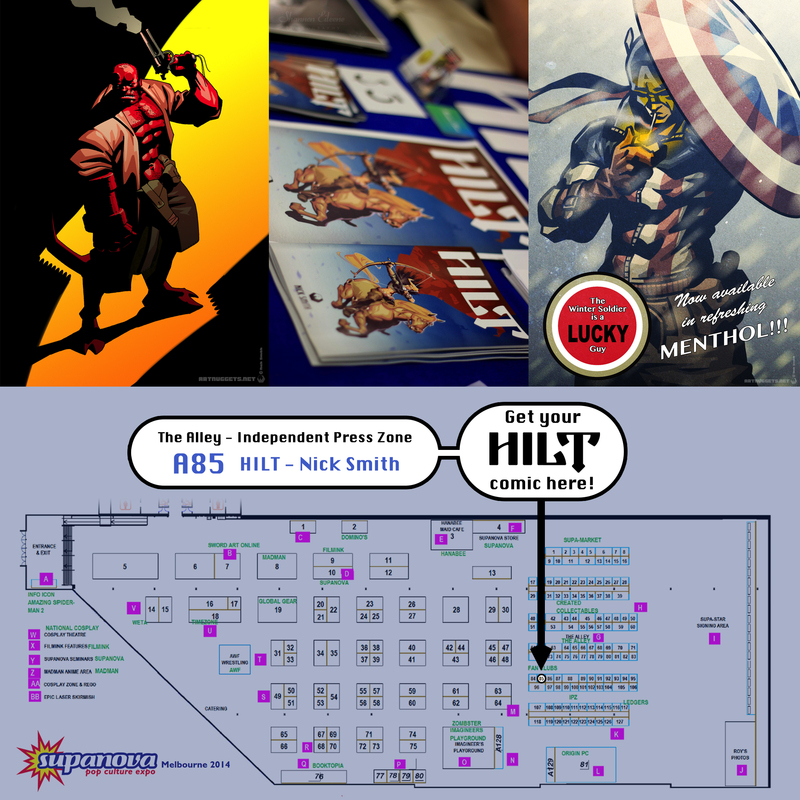 You’ll be able to find me in The Alley at Booth A85, where I’ll be pimping my new comic Hilt, as well as prints. Hope to see some of you Victorians there! Looking forward to this weekend’s Supanova at the Gold Coast convention centre. You can find me at booth A29 in the Independent Press Zone of The Alley. 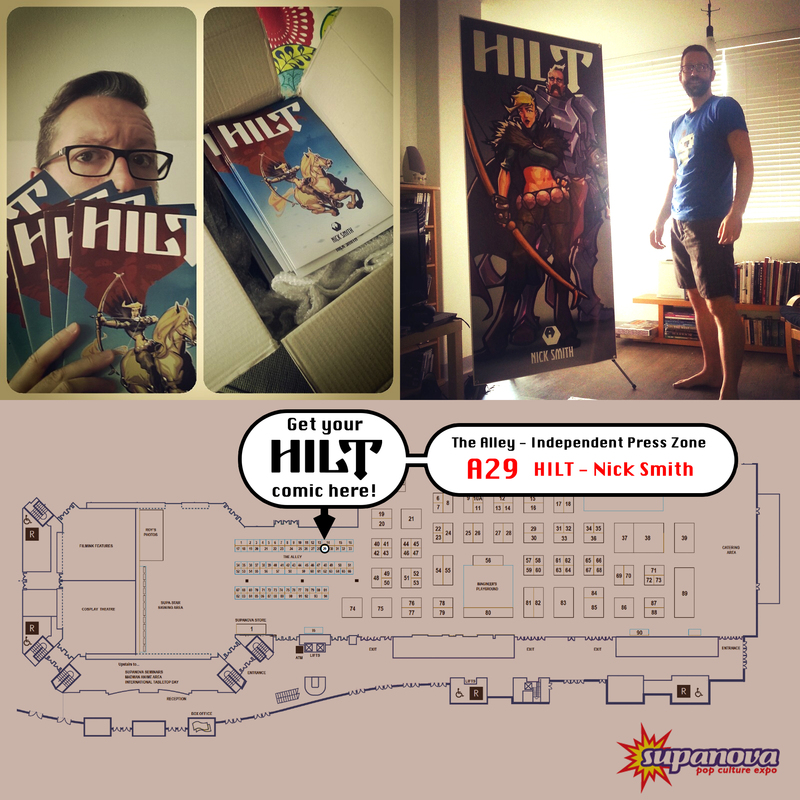 I’ll be there selling my comic Hilt with my mate Zachary so come by, say ‘hi’ and buy!